WEST LAFAYETTE, Ind. — More than 250 Purdue Musical Organizations students are preparing for their end of season shows. The Purduettes will present their Spring Spectacular at 7:30 p.m. on Saturday (April 16) at the Long Center, 111 N. 6th St., Lafayette. Tickets are $15 for adults and $10 for students and are on sale through PMO at 765-494-3941. On Sunday (April 17), the Purdue Bells, University Choir, Heart & Soul and All Campus & Community Chorale will perform a free concert at 4:30 p.m. at University Church, 320 North St., West Lafayette. 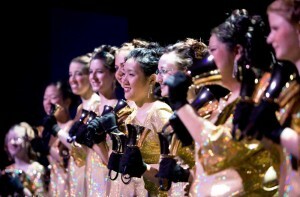 The Purdue Varsity Glee Club will perform at 7:30 p.m. May 14 at Stewart Center’s Loeb Playhouse on the Purdue’s campus. Tickets are $15 for adults and $10 for students and are on sale through the Purdue Box Office. Call 765-494-3933 for tickets. All performances are open to the public. Each ensemble is one of a variety of performance opportunities within Purdue Musical Organizations. Purdue has no school of music, so nearly every academic major is represented in the organization.